Mercedes-Benz has announced the details of its new S63 AMG at the Frankfurt Motor Show - a high performance version of the recently launched luxury car. The S63 has a 5.5-litre twin-turbo V8 producing 585PS and an impressive 900Nm of torque between 2250-3750rpm. It’s likely to cost upwards of £110,000, though official pricing is to be confirmed. 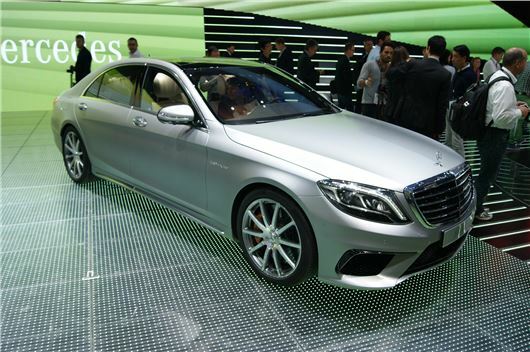 Short and long wheelbase models are to be offered and long wheelbase cars will be available with 4MATIC all-wheel drive. The official figures claim a 0-62mph sprint time of 4.4 second – or just 4.0 seconds for the 4MATIC. Top speed, regardless of model, is limited to 155mph while fuel economy is quoted at 27.9mpg for the rear-drive and 27.4mpg for the all-wheel drive. Transmission is the now familiar seven-speed MCT, which is fitted to most AMG models. It can be left to change gears on its own or can be overridden with paddles, plus it features settings for efficiency or performance. Choosing manual or performance modes makes the exhaust note more purposeful and changes the ESP settings to make the handling more entertaining. After all is said and done the S-Class is a luxury car, so the cabin features an array of technology including a large TFT display, attention assist, collision prevention assistance, all-LED headlights and some indulgences including 10-speaker audio and an assortment of AMG touches and top-quality materials. Numerous optional extras, both cosmetic and functional, are offered.